Derek McInnes praised his Aberdeen players' composure as they ended their run of four Premiership defeats and a draw with victory over Dundee United. "Winning the game 2-0 pleased me but it was the manner in which we did it that delighted me," said the Dons manager. "We did it by being calm, getting the balance right between the intensity when we don't have the ball - and making good decisions - to being calm and confident on the ball. "The performance was nice and calm." Aberdeen had the best of the first half but could not breach the United goal at Pittodrie by the interval. However, Irishman Adam Rooney nodded the Reds in front from close range seven minutes after the break. 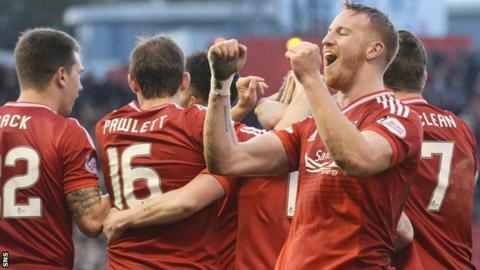 Later, Jonny Hayes struck a cracking second to seal a much-needed win that lifts third-placed Aberdeen to within four points of leaders Celtic who play Ross County on Sunday. "The early goal in the second half settled us down and we played some good stuff from then on in and Jonny's goal put a better reflection on (the game)," added McInnes. Hayes, in particular, impressed for the home side and McInnes was delighted that the Irish winger's work ethic has been rewarded. "Jonny's recent performances have been excellent, even when we haven't won games," he said. "He has been single-minded and has worked hard to improve his form. "We put a demand on him to score more goals and hopefully that is the start of a few for him. "We hope the supporters enjoyed today because they have been suffering the same way we have." For Dundee United manager Mixu Paatelainen, there was "massive frustration" as their dismal run was extended to one win in 12. "Our first-half performance was okay," he told BBC Scotland. "Once again that slackness crept in in the second half. If the ball is up in the air [for Rooney's simple header] one yard from our goal line it has to be our defenders who react first. If they don't, we pay the price. "We have to be on the front foot. Too many players are on their heels, not ready to pounce and be first on the ball. "It's in every situation, whether it's attacking or defending or in transition, you have to move first and we move second. "It is difficult but you have to stay patient and work with the players. There comes a time when you say, 'okay, we need new players', but I want to improve our existing squad." Asked if he would like to add to his squad, he replied: "Yes, I would. It's not entirely in my hands."